Sgt. 1st Class Ryan Allen Gloyer was born on April 6, 1982. In 2004, Gloyer graduated from Thiel College with a Bachelor’s of Education and a Bachelor’s of Science in Psychology, while also serving as a student teacher for an elementary school. 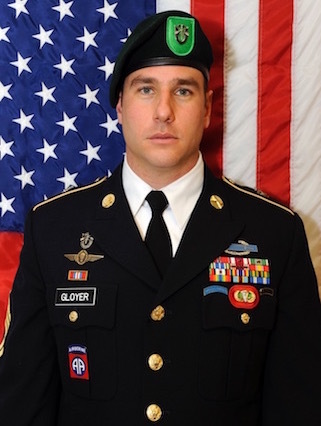 Upon graduation, Gloyer enlisted in the U.S. Army as an infantryman, completing basic training, advanced individual training, and airborne school at Ft. Benning, GA.
From 2005 to 2013, Sgt. 1st Class Gloyer was assigned to the 82nd Airborne Division where he served as a squad leader and section leader in a heavy weapons company. He served in 3rd Battalion, 325th Parachute Infantry Regiment and 2nd Battalion, 508th Parachute Infantry Regiment, 82nd Airborne Division where he completed two combat tours to Afghanistan in support of Operation Enduring Freedom. Sgt. Gloyer then served as an instructor for the 82nd Airborne Pre-Ranger Course. Gloyer successfully completed the Special Forces Assessment and Selection Course and completed the Special Forces Qualification Course in September 2014. After graduation, he was assigned to Bravo Company, 2nd Battalion, 10th Special Forces Group (Airborne) at Fort Carson, CO as a Special Forces Communications Sergeant on SFOD-A 0224. During his tenure with SFOD-A 0224, he served the detachment on an austere deployment to Chad. He then drove the detachment through a rigorous Pre-Mission Training cycle in preparation for deployment to Afghanistan. SFOD-A 0224 deployed to Afghanistan in June of 2016 where Gloyer was an ODA split team cell leader and lead tactical trainer and advisor to Afghanistan’s premier strike force unit, the Ktah Khas. Gloyer advised and assisted the Ktah Khas on 7 Afghan-led, 13 enabled, and 5 partnered operations before being killed in action on 03 November 2016 in Kunduz Province. Sgt. 1st Class Gloyer’s military education includes: Senior Leaders Course, Advanced Leaders Course, Basic Leaders Course, Airborne School, Ranger School, Static Line Jumpmaster Course, Urban Mobility Breaching, Military Freefall School, Survival Evasion Resistance and Escape, and the Special Forces Qualification Course. Sgt. 1st Class Gloyer’s awards and decorations include: Purple Heart, Bronze Star Medal with Valor, Bronze Star Medal, Meritorious Service Medal with one Oak Leaf Cluster, Army Commendation Medal with one Oak Leaf Cluster, Army Achievement Medal, Army Good Conduct Medal with bronze clasp and three loops, National Defense Service Medal, Afghanistan Campaign Medal with three Campaign Stars, Global War on Terrorism Service Medal, Non-Commissioned Officer Professional Development with Numeral 3, Army Service Ribbon, Overseas Service Ribbon with Numeral 2, NATO Medal, Special Forces Tab, Ranger Tab, Combat Infantryman Badge, Expert Infantryman Badge, Military Free-Fall Parachutist Badge, and the Parachutist Badge. Sgt. 1st Class Gloyer is survived by both of his parents and two brothers.